Running an effective ministry is all about teamwork. No one person can do it alone. In order to effectively tend to your flock and give them the support and attention they need, you must have a team of people working together. That’s why ministry staff and lay leaders are such an essential part of your church community. They allow you to accomplish more, to reach more members, to enable people to become disciples who make disciples. In order to help your support staff and lay leaders be as effective as they possibly can you want to equip them with the tools they need to succeed. That’s where technology comes in. Small groups are a great way to foster relationships with other believers and encourage spiritual growth. But managing small groups can easily devolve into an unwieldy black hole when it comes to tracking participation and engagement. Some churches ask their small-group leaders for an average estimate of the number of attendees. Others require their group leaders to use sign-in sheets. This method can be effective, but it comes with its own set of challenges inherent to any manual analog system. Any system that relies on manual processes for accuracy is likely to succumb to human error. The good news is there are now mobile apps available that empower lay leaders to report attendance and make notes about the members they are discipling. The apps automatically update the Church Management System with who did and didn’t attend. Later, church staffers are able to run attendance reports from which church leaders can gauge overall small-group engagement levels. This is a real time-saver for office staff and it leads to more accurate information. In 2003, I was a guitarist in a secular rock band. I had given my life to Christ and had been serving on the worship team in my local Church. I was often at Church four to five times a week. I loved my new friends, my pastors and my life. I was connected… And then I wasn’t. My band went on tour and my support system went from 5,000 to nothing. Sure, a couple of friends reached out, and one of the pastors gave me a call, but it was hard. I was a young believer and I felt alone. And while some people knew I was away and unable to engage in the body, to most it seemed like I just dropped off the face of the earth. The good news is today Church leaders don’t have to rely on memory alone to keep track of all the “sheep” in their flocks. Technology makes it easy to track all of your members and assign outreach tasks to the folks on your ministry team. These tasks trigger push notifications on lay leaders’ mobile phones and enable them to see the task along with the phone number, address, Google map, and notes for the assignment. These new mobile tools enable support staff and lay leaders to better do their jobs. And that results in a more connected community for your ministry. Download our free resource “5 Ways That Mobile Tech Can Transform Your Ministry” to see other ways mobile technology can help support your church. A while back (probably more than a year ago), we added a tab on the organization page named Prospects. We already had tabs for Members and Guests (as well as a few other tabs which are not part of this conversation). There was so much to talk about around that time (new filtering and sorting options, new UX, and more ), I’m not sure we ever fully explained the purpose of the Prospect tab and how it was intended to be used for ministry. We want to correct that now. We have defined each of these types of people associated with organizations as they relate to their use in TouchPoint. Also, we have explained more about the why and how of using Prospects, and how Guests and Prospects are different (and how they sometimes are alike). If you are not using Prospects or if you do not really understand the Guest tab or if you just want to see what you might be missing, please click the link below and read the article. You might also want to take a look at this other article that explains everything you see on an organization page. How many of you know you can view people on multiple tabs of an organization all in one list? You can! You can also use checkboxes or sub-groups to filter the list of people on the organization. Refunds – Did you know…? Did you know that most payment processors such as Sage, have a limit for how long they will issue a refund after the payment has been made? Most of them will only process a refund up to 6 months after the date of the payment. After that, you will not be able to issue a refund on the processor’s website or through TouchPoint. If you think about it, that makes total sense! If you are going to giving them a refund after that time frame, write them a check. Then go to the Transactions Log (or the Member Dialog if they are still enrolled in the organization) and make an Adjustment to indicate that the person never actually paid anything. Why let yourself get in this situation in the first place? Taking payments, then issuing refunds does cost the church the amount of the processing. If you are using Terms for an online registration (from the Messages tab), indicate that no refunds will be issued after a certain number of days. If you do not use terms, make that point clear in the Instructions on the registration and again in the Confirmation email. For some registrations, you may not issue refunds at all. Those cases should definitely be made clear to the registrant prior to their completing the registration. Each church should set its own policy regarding refunds in general. But the key here is to think about this issue and actually set a policy for your church. The Transactions Log (where you issue refunds and lots more) has tons of information and a lot of functionality. If you have not looked at the help article recently, you should probably take a refresher look at it. http://tpsoftware.wpengine.com/wp-content/uploads/2018/10/TP-logo-blue-no-slogan-300x62.png 0 0 Steele Billings http://tpsoftware.wpengine.com/wp-content/uploads/2018/10/TP-logo-blue-no-slogan-300x62.png Steele Billings2016-02-24 14:00:462016-02-24 14:00:46Refunds - Did you know...? Some give gifts at Christmas in remembrance of the gifts the three wise men brought to Jesus – gold, frankincense, and myrrh. Others give to follow God’s example of giving His Son Jesus for us, or to remind us of the gift we have of salvation and the Holy Spirit. Whatever reason you give wrapped presents to friends and family this Christmas, the reason we give monetarily and of our talents to the local church, is because God’s Word tells us to do so. And it tells us to give cheerfully. God loves a cheerful giver. Even cheerful givers appreciate being thanked. It lets them know that the person accepted their gift and appreciates it. The same is true when we give to our church or to a charity. We like to know that the gift was received and that it was appreciated. That is not WHY we give, but it IS a responsibility of the recipient to acknowledge and thank the giver. Year-end contribution statements are not only a tax document; they are a way for us, the church, to say “thank you” to our donors. Whether you mail statements or send an email letting donors know they can access their own giving records, consider including a “thank you” message in that envelope or email. We like to let our donors know some of the many ways the church used their donations to share Jesus throughout the past year. If you mail statements, that “thank you” might be a letter from your pastor that lists some of the projects that you helped sponsor. If you send an email notification, it might contain a video message, actually showing some of the ways tithes and offerings have been used to further God’s work. Or perhaps you just want to modify the ‘notice’ blurb of the statement itself. While year-end statements take time, effort, and money (if you mail them), they are an important part of giving and receiving – and that is the act of saying “thank you”. Can you believe it is that time again already? Time to send those year-end contribution statements to those very important people – your donors. While sending them may seem like a chore, let’s stop and think about what those donations mean. They are actually someone’s act of worship to God. Yes, that money is used for ministry and for the day-to-day operation of the local church. 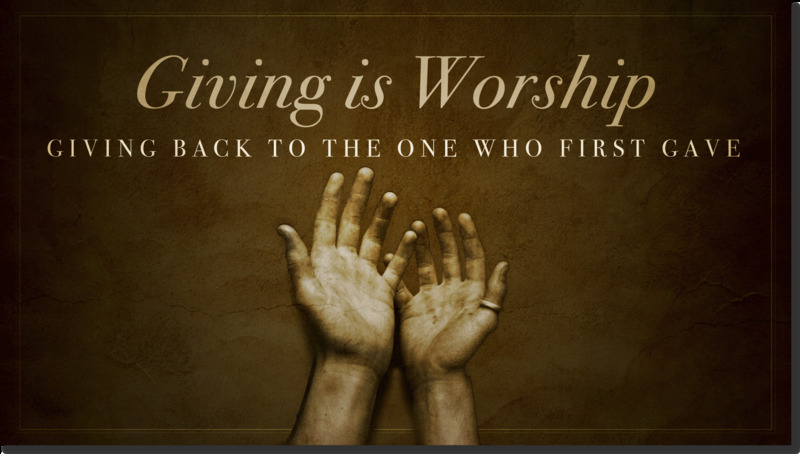 But it starts in the heart of that donor who loves God and is obedient by giving freely from what God has given to them. Maybe it’s the small donation from a little widow, that you know was sacrificial…or the pennies and nickels of a child, whose parents are teaching what it means to give…or the very large donation from a wealthy businessman, that may be just as heart-felt as that of the widow. Regardless of the size of the donation, let’s bear in mind as we print those statements and stuff those envelopes, that these are representations of someone’s worship and obedience to God. This might be your first year to send statements via BVCMS/TouchPoint. If so, or if you want to check out some options you may not know about, please check out the help article on Contribution Statements.